ocals call it the “Switzerland of Maine” for its breathtaking mountains and picturesque waters, yet Dedham is just one of a cadre of communities in The Pine Tree State where tap water may not be as safe as it appears. Like the majority of the state, many of Dedham’s denizens rely on private wells for the water they drink, bathe in and perhaps use to make infant milk formula. But the water trickling from the tap—unlike water from its public water sources—goes untested and is not subject to any state or federal guidelines. And although homeowners are encouraged to get their water regularly tested to ensure that worrisome levels of bacteria or naturally occurring minerals have not crept in, many residents do not follow that advice. Yet newly available data, released in recent months, indicates that in some 10 communities in the state wells harbor dangerously high levels of fluoride. In some cases, the wells contain more than double the level that the U.S. Environmental Protection Agency has deemed the acceptable maximum exposure level. In small quantities fluoride is known for helping to tamp down the blight of tooth decay; most municipalities in the U.S. add it to their water supplies as a public health measure. The U.S. Centers for Disease Control and Prevention recognizes water fluoridation as one of the top 10 greatest public health achievements of the 20th century. Mainers may be sipping similar amounts of fluoride. “The sort of levels we’re talking about that are high in China are the sort of levels we see in some private wells,” says Andrew Smith, Maine state toxicologist. In Dedham, for example, data from 37 wells indicates that 37.8 percent of that water is above the state’s maximum exposure guideline for fluoride. Dedham is not alone: in Surry, Prospect, Franklin, Sedgwick, Penobscot, York, Harrison and Stockton Springs, more than 10 percent of the wells appear to have fluoride levels higher than the state cutoff. The level of potential fluoride exposure encountered by residents may be even higher when factoring in fluoride exposures from dental rinses and toothpaste. The new data on fluoride levels in Maine water is not from a random sampling of homes in Maine nor is it complete. The data comes from homeowners who voluntarily sent water samples into state labs for testing, which potentially skews the sample. But it does provide the first snapshot of what may prove to be a larger problem. The state’s suggested limit of two milligrams per liter is half of the EPA limit but many public health advocates argue that limit is far too high. The agency is currently considering lowering its cutoff for fluoride exposure, although it does not expect to have completed its review of the issue until 2016. The U.S. Department of Health and Human Services has proposed adding fluoride to water in concentrations no greater than 0.7 milligram per liter to avoid any unwanted health effects. Why are the Maine levels so high? Geology. Granite—especially certain kinds such as alkali and peraluminous granites—contains high levels of fluoride, boosting the chances of wells drawing it from that water. Certain other New England states such as New Hampshire (known as “The Granite State”) and Rhode Island may also have private wells at risk because they, too, sport large amounts of the potentially problematic rock. 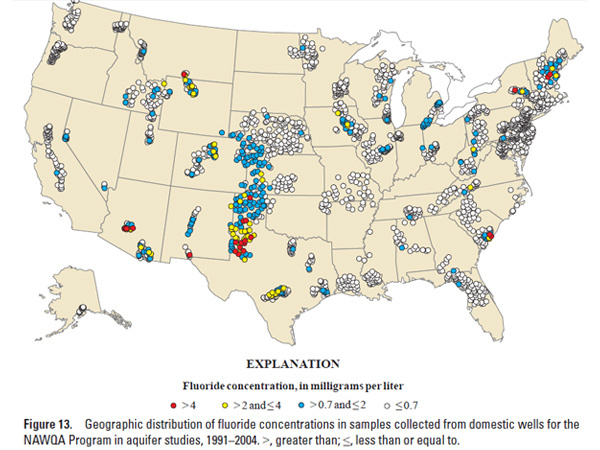 People living in areas with high fluoride concentrations can take steps to mitigate the problem—but it is an open question whether they will. Countertop filters like Brita pitchers are not effective but advanced technology such as reverse osmosis systems (which may start around $150 per unit) will capture much of the fluoride. Unfortunately even people whose water is contaminated with far more harmful chemicals frequently take no action. Researchers recently surveyed residents of central Maine whose well water contains high levels of arsenic—an odorless, tasteless element that can cause maladies including cancer, blindness and numbness in hands and feet. They reported that 27 percent of those Mainers did nothing about it. When asked why not, people reported a lack of concern about arsenic and reluctance to pay for any mitigating action. Editor’s Note: Both arsenic and fluoride are easily managed by reverse osmosis.